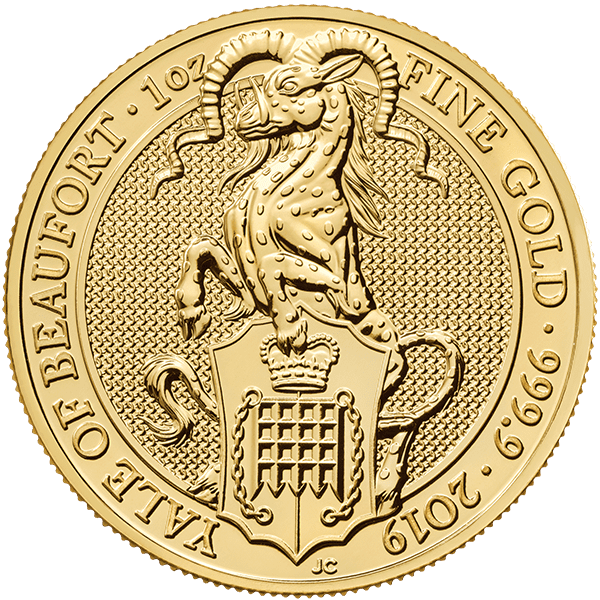 Gold Yale of Beaufort is the sixth in the Royal Mint’s Queen’s Beasts bullion series. This fabulous design is available 1 oz and 1/4 oz of .9999 fine gold and 2 oz of .9999 fine silver. 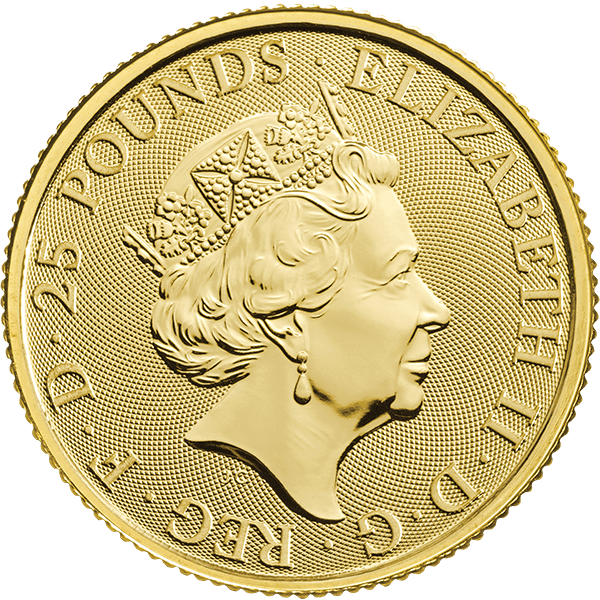 The popular 10-coin series launched in 2016 with the Lion of England design available on the Royal Mint’s first 2 oz silver bullion British coin. The series has grown to include silver as well as platinum coins. The inspiration for this series is the statues that adorned Westminster Abbey’s entrance for Elizabeth II’s coronation in 1953. Each statute is a real or fantasy creature that represents the heraldic beasts of the various English rulers in the Queen’s lineage. The plaster originals are in Canada, stone copies are at Kew Gardens, outside the palm house. The yale is a mythological beast from ancient times. It is described as black or reddish in color, the size of a hippopotamus with an elephant’s tail and a boar’s jaws. The Queen is connected to the yale through the first Tudor King, Henry VII, who had inherited it from his mother, Lady Margaret Beaufort. Lady Margaret was a key figure in the Wars of the Roses, which led to the founding of the Tudor Dynasty. Her role in history gave the yale prestige and symbolic meaning. It was first used in the coat of arms of John, Duke of Bedford, and by England’s House of Beaufort.